Anthony Hopkins reprises his Oscar-wining role as the infamous Dr. Hannibal Lecter in the thrilling prequel critics are hailing as "A Suspenseful Masterpiece!" (Fox-TV) After capturing Dr. Lecter, FBI agent Will Graham (Edward Norton) retires - only to be called back to active duty to hunt down an elusive killer, "The Tooth Fairy" (Ralph Fiennes). 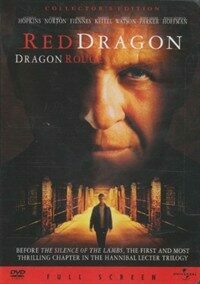 Red Dragon is the electrifying, critically acclaimed movie that "returns the series to The Silence of the Lambs form" (Jack Mathews, New York Daily News).